in the centre in the background. Walkers: Les Roe (leader), Alan Dow, Andrew Noseda, Debra White, Conrad White, Kim Attard, Sarah Coll, David Vaughan, members of GBC, ORWTA and visitors. We gathered at Haines Junction in the early morning mist, while the carefully organised car shuffle was put in place. Then a short ride down Turton's Track, and eight very keen walkers were ready for the off. As we made our way up the short hill at the beginning, the sun broke through, and we were treated to a beautiful blue sky sunny day. The good weather spurred us on and we reached the morning "tea break" stop at Log Landing in just an hour. Then despite some ribbon maintenance, and having to clear a large branch blocking the path, we reached the lunch spot in the farm paddock by 12:30, and enjoyed a leisurely break, while taking in the beautiful view. Thanks to a new gate at the bottom of the paddock, we were soon able to find the start of the big hill climb up to the ridge. 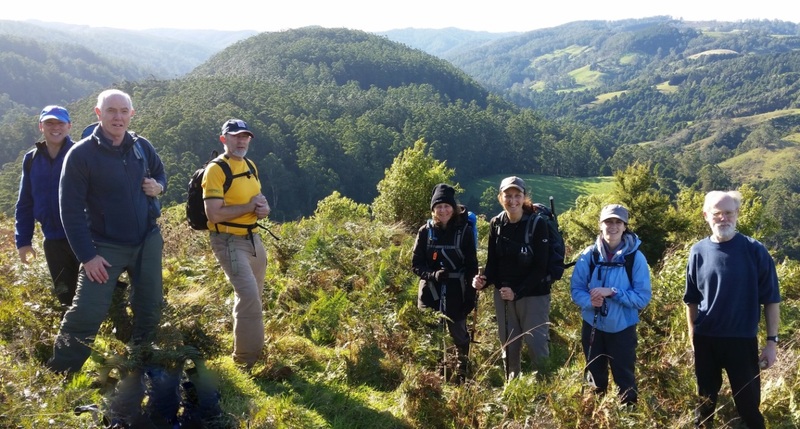 As we were ahead of schedule, we had a well-earned rest at the top of the climb and enjoyed the magnificent views across the Wild Dog Valley to the hills beyond. Then an enjoyable walk along the ridge, with more magnificent views before approaching Crow's Nest Lookout. We reached the finish at 2:30, and having had such an enjoyable walk, Andrew offered us all refreshments at the Great Ocean Road Brewhouse. This offer was gratefully received, and was a perfect end to a very enjoyable and energetic walk. Thanks for the good company! Les Roe. 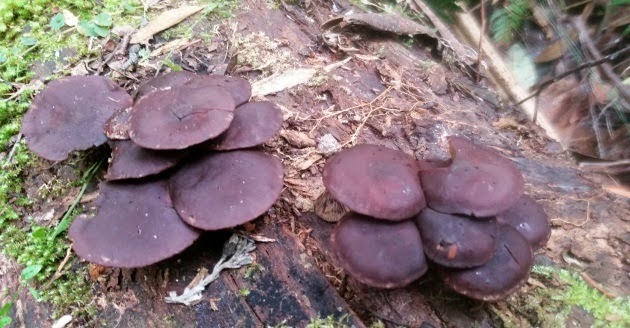 An Old Timer rotting on the forest floor. 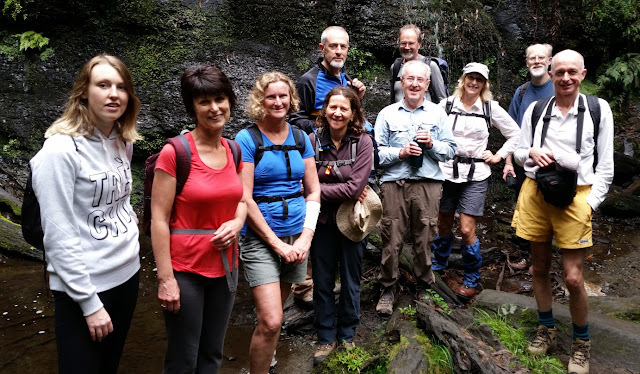 Walkers: Bernard Jordan (Leader), Linda Carter, Alan Dow, Bruce McGinness, Matthew Kinross-Smith, Ann & Lauren Molan, Annie Mostin, Les Roe, Conrad and Deborah White. Members of GBC, ORWTA and Camperdown Bushwalking Club. This sign seemed to summarize our walk nicely; 5 waterfalls & 1 canyon … WOW !! 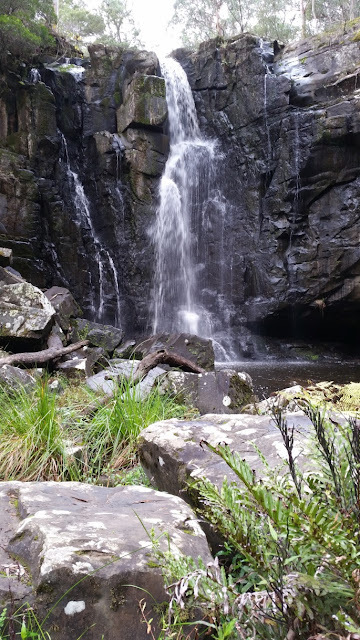 We left the carpark at Allenvale Mill Site and headed north to flowing Phantom Falls. 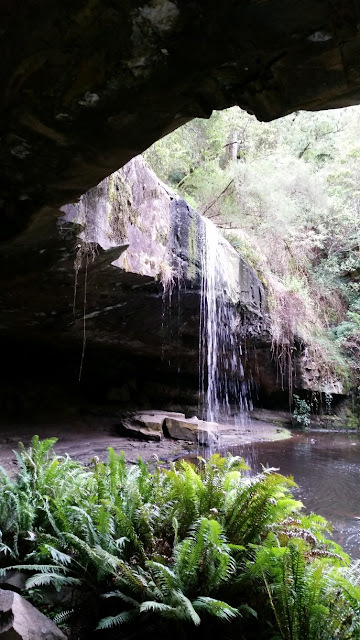 Then we went via the intriguing Canyon to Henderson and Won Wondah Falls, before walking along old tramway paths to Lower and Upper Kalimna Falls. Continuing on, some of us saw, and all of us heard, a tree fall down nearby. As we were walking along Garvey Track we met an artist painting a mural of the bush including a man searching for his car keys in the bush. I think most of us have got car keys stories!! From Garvey Track, we took Sheoak Track towards the coast, visiting Swallow Cave (alas no swallows) and Sheoak Falls (alas not much water) before the finish. OTWAY RANGES WALKING TRACK ASSOCIATION INC.
Another year has well and truly started and I would like to take this opportunity to wish everyone a ‘Happy Australia Day’!! I think these days, time flies whether you’re having fun or not. However, we prefer to have fun! 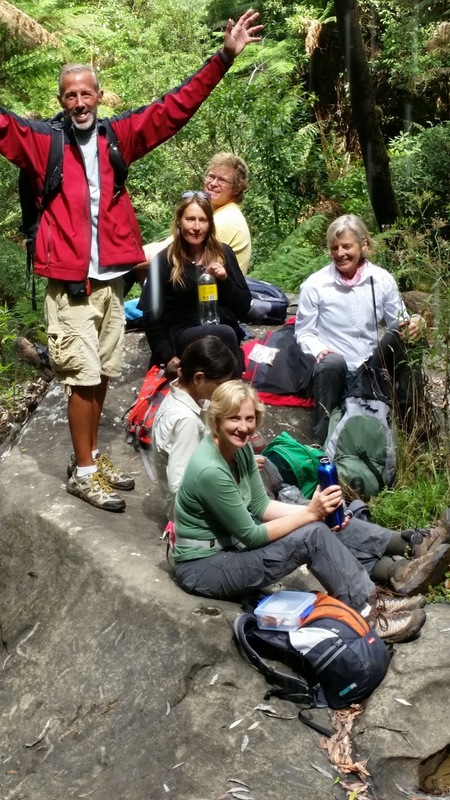 And for most of us, bushwalking is one way of having FUN!! It just takes an effort to arrange this great pastime around our busy lives. As I see it, there are two major reasons for ORWTA’s existence. 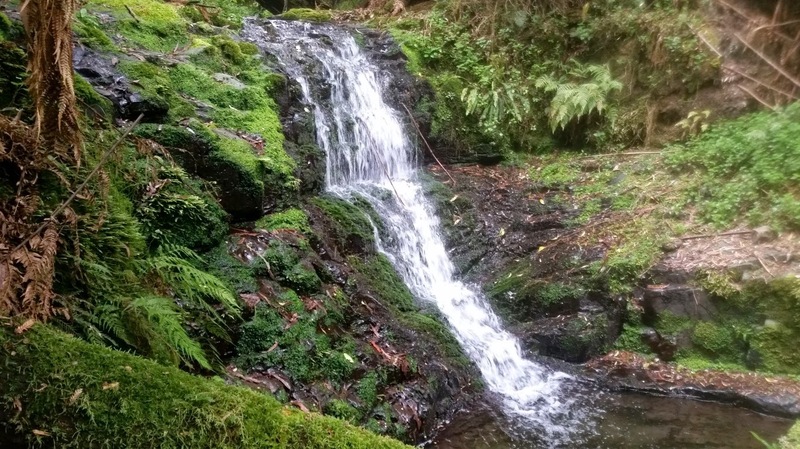 The first is to continue to lobby the Government and persevere with various avenues that will result in the Trans Otway Waterfalls Walk coming to fruition. However, for many reasons, there has been no progress on this of late. The second reason is to foster the fun, social and healthy aspects of bushwalking in the Otways. 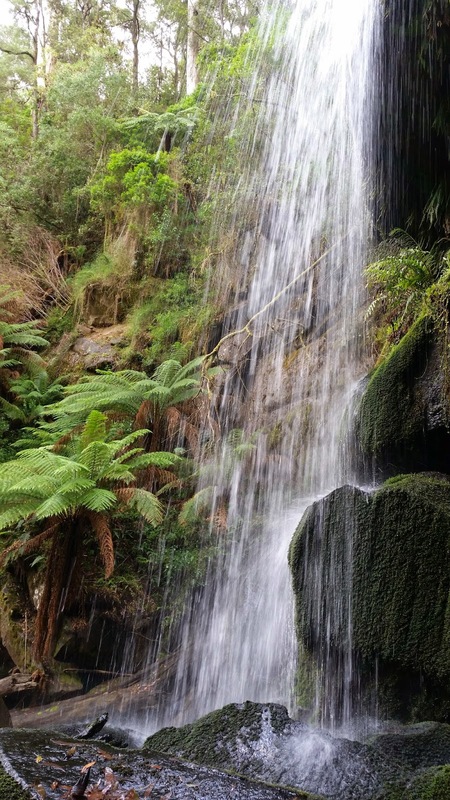 The Otways is an amazingly diverse place with the cool temperate rainforest, tall eucalypt forests, the multitude of waterfalls, the coastal heathlands and the rugged but pristine coastline. Whether you are new to walking in this region, a regular visitor or, like myself, who has lived here all of one’s life, it is a very rewarding area to explore. The social walks conducted monthly are still proving popular and necessary to continue to be able to keep our proposed route clear. 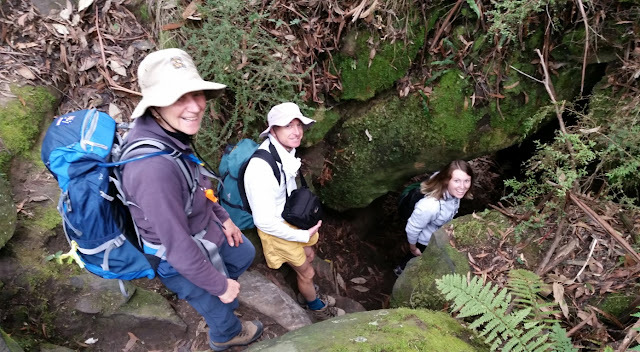 Over many years, ORWTA members have enjoyed so many walks both along the proposed Trans Otway Waterfall Walk and other locations in the Otways. Very few of our walks in that time have needed to be cancelled or rescheduled. However, we have had trouble of late. Bushwalkers, whether regular walkers or not, are certainly keen to get out in the bush. I fully appreciate that, especially if it’s been a while since you’ve had a walk, or a favourite walk is on or you just want a break from your normal routine. However, sometimes things happen beyond our control with weather, trip leader unavailability and communication. As a club, we must be proactive and show that we are a responsible organisation and make tough decisions when needed. Presently, some of our routes do need a tidy-up with clearing away fallen limbs. Some of us are able get into the bush regularly to help with carrying out this task. In saying that, we are a volunteer organisation and most of us still work so we can only do as much as we can do with the volunteers we have available as this needs to fit around with the rest of our lives. Wild Dog Track is one track that we normally like to do every year. We were not able to do it when scheduled last February due to a Total Fire Ban Day. In December, again this walk was rescheduled to be done, but a predicted widespread rain event led to an executive decision to call the walk off. So it will be a case of ‘take 3’ as it is down for May’s walk. ORWTA are very thankful for all our trip leaders; most are our members and some are members of other clubs that assist from time to time. 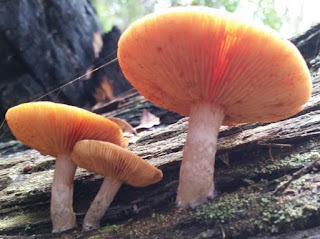 Through their knowledge (maybe of a particular area), passion and expertize, we are able to offer many diverse walks. Having lost several key committee members over the last year which have been due to illness, work commitments, retirement and having left the area, our club is certainly going through a rebuilding stage. ORWTA membership continues to be steady which is extremely encouraging. Although, we do have a good member base, one of our problems is that our members come from a very wide area. So ORWTA would appreciate any help that can be given; maybe on the day of the walk, leading a walk, help with a recce or clearing tracks, or your expertise may be communicating / liaising with various Government agencies. Any help will be gratefully appreciated. Let’s hope our Club has a successful 2015. So now is a good time to mention the efforts of Bernard Jordon who has been involved in ORWTA for a very long time. 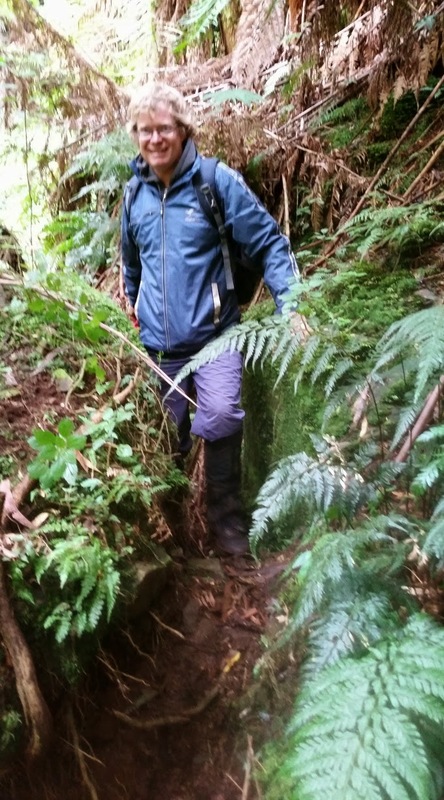 Like a few in our club, Bernard is a member of both ORWTA and the Geelong Bushwalking Clubs. He had a very important role of being the liaison between the two Clubs, making sure the correct walk info & trip report was submitted to GBC’s monthly magazine, being the Geelong contact to organise car-pooling, assisted in the reconnaissance of tracks and has lead so many of our walks. He is stepping down from his role with ORWTA to watch the ‘grass grow’ and will no doubt be spending more time at Sandy Point. On behalf of the Committee and members of ORWTA, I would like to take this opportunity to thank Bernard for all his involvement over the many years with ORWTA. His willingness to lead walks has certainly been invaluable in our club. A job well done and much appreciated !!! Hopefully, you will join us on our walks from time to time. 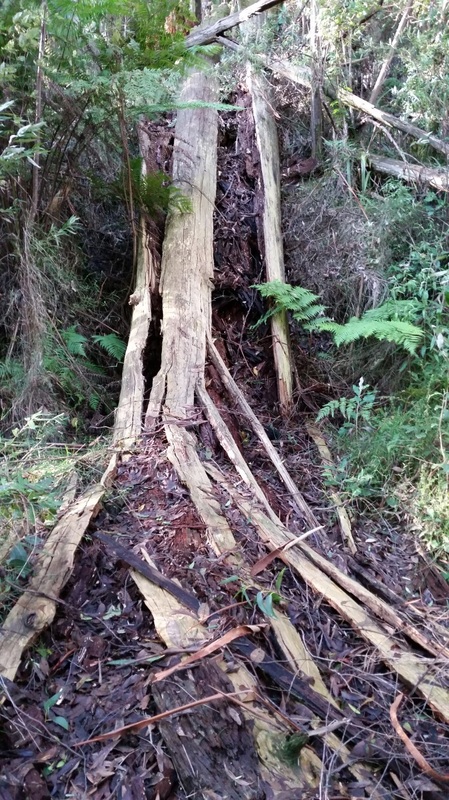 We heard, from a couple of sources, that several tracks in the long-established network of paths in the Lorne area were to be closed permanently. However, in December when this matter was raised, the Parks Vic Ranger for Lorne was adamant that no such closures were forthcoming. Let’s hope for all lovers of walking that these tracks stay open permanently. 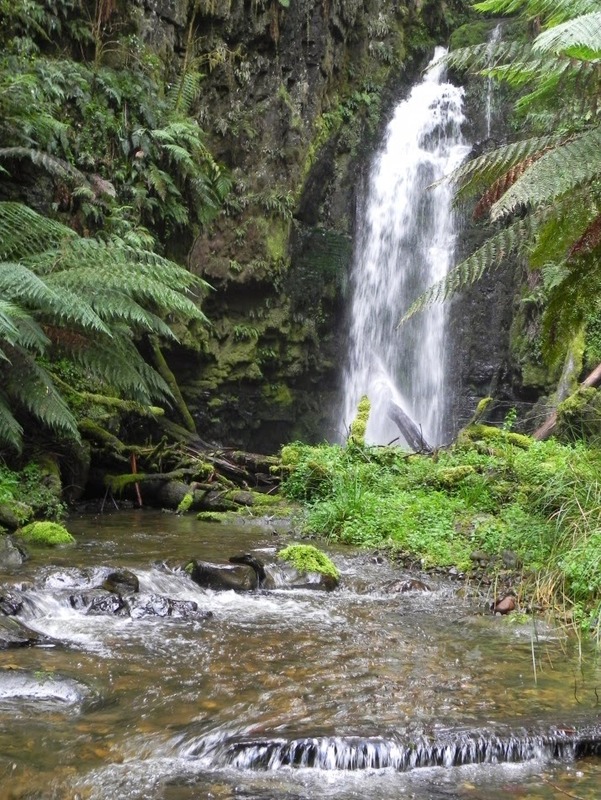 NOTE- It was very sad to hear of young child recently who was critically injured after being hit by a fallen branch on one of the Lorne tracks near Erskine Falls. He was on an outing with his family when the tragedy happened. 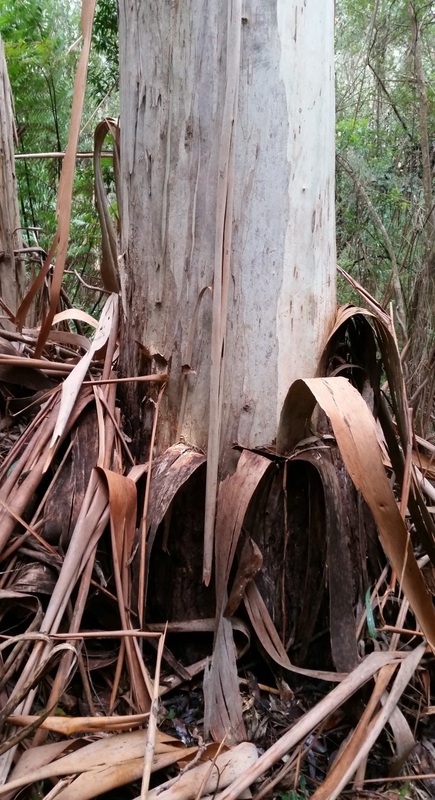 We all love walking in the Australian Bush, but these incidents, although very rare, do make us aware that it can be dangerous at times. And while we are on the subject of closures, Marriners Falls has been closed for many years now. It has been assessed as being ‘unsafe’. There is been a concentrated push in 2014 to re-open these Falls before they are ‘closed’ permanently. 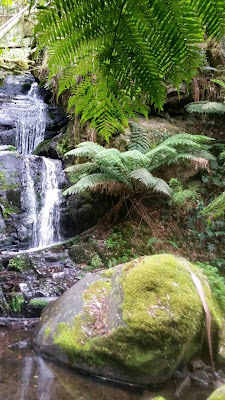 The track to the falls is certainly no more dangerous than many of the tracks through the Otway forests. 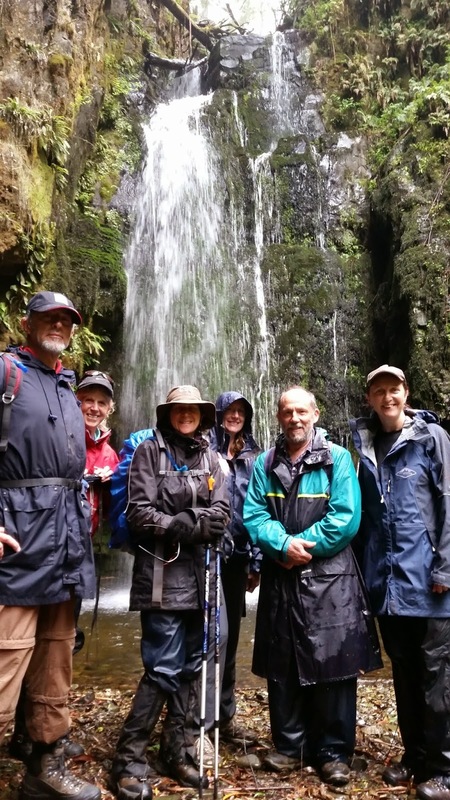 There is now a group known as "Friends of Marriners Falls". The ORWTA committee members wholeheartedly support this group, and we encourage all members to add to and support their Facebook page. This can be found by going to the Apollo Bay Chamber of Commerce & Tourism website, at; "www.abcct.com.au/friends" and clicking on the 'leave a comment' option just below the page title. Also, if anyone has any photos or history of past visits to these Falls please feel free to share them with this group. 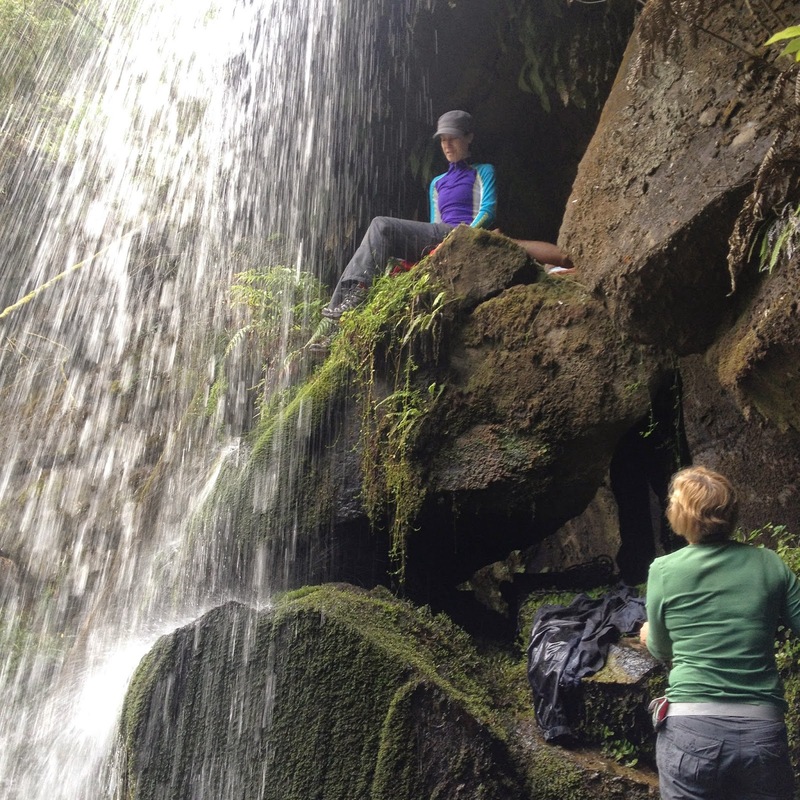 Marriners Falls is such an important asset to Apollo Bay. 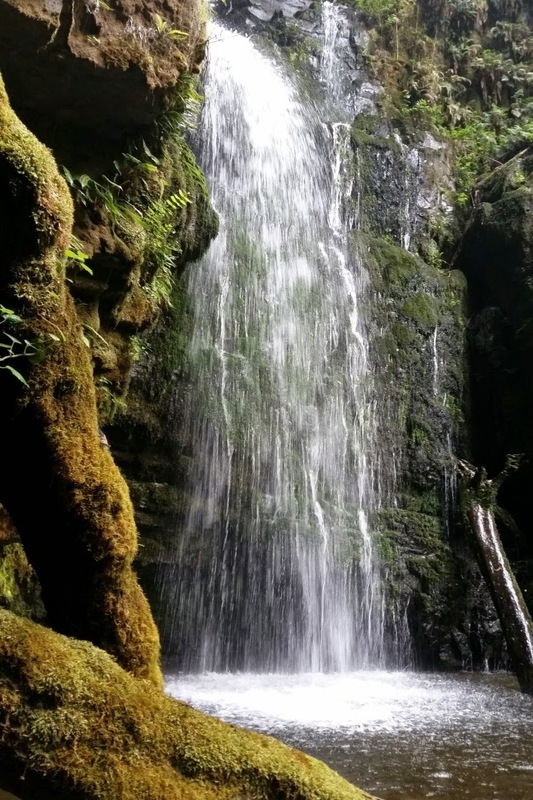 It has a rich history dating back to early settlers visiting the Falls in the late 1800s. 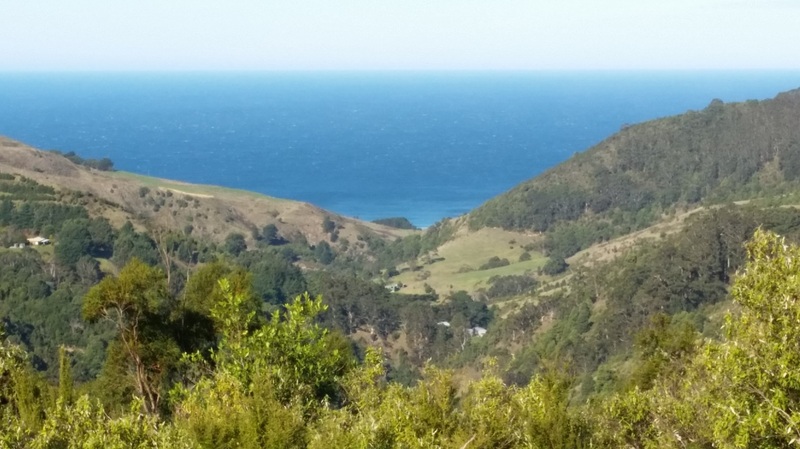 Unlike Lorne, which has many waterfalls and forest tracks of which to walk, Apollo Bay has only got the short track to Marriners Lookout, the start of the Great Ocean Walk and Marriners Falls. Marriners Falls have been a lovely cool place to visit with the family particularly on those hot days in the Summer holidays. There is new walk / cycle signage around Apollo Bay to help visitors get to places in the town. On several of these signs, there is a photo that our Secretary took on the proposed ‘Highview Walk’ that we did last August which acknowledges our organisation. Great Les ! 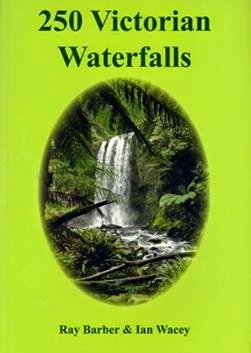 We still have several copies of 250 Victorian Waterfalls, so if anyone would like a copy sent to them, contact Alan on 0400 404 046. We have just released our 2015 Calendar of Walks. I hope there is something in this for everyone and that you have free time available to do some of them. Our social walks are normally held on the first Sunday of the each month. However, sometimes we hold it on the 2nd Sunday of the month to avoid such events as Father’s Day or Easter. We do ask for a gold coin donation from participants on the day of our walks. Monthly Meetings of ORWTA Inc. usually take place after the scheduled Social Walk. The venues for the Meetings are generally in the region of that month’s walk. Typically held at Apollo Bay, Forrest or Lorne, however, we have held them at Wye River, Deans Marsh and Beech Forest in the past. They involve a relaxed meeting often over dinner or a drink. We acknowledge the assistance given to us from the Bendigo Bank in sponsoring the yearly costs of our Website. New and return members are always welcome. We are asking all members to inform their family and friends as to what our organization does and so they may become ORWTA members or at least enjoy a walk with us. Recent new members that have joined are Stephen Kerr and Andy Hewat. 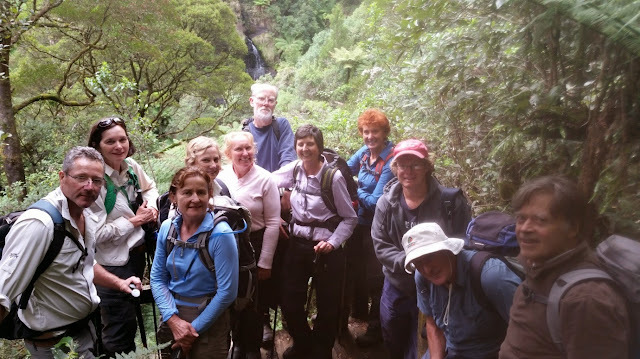 I hope you enjoy meeting the many other walkers and gain some great experiences while walking in the Otways.